Gerber Carnivore XP flashlight. Illustration courtesy of Gerber Legendary Blades. The high-tech Gerber Carnivore XP flashlight includes light modes for preserving night vision (provided by two red LED's) and Trax blood tracking technology (two red and 8 blue LED's in combination), as well as a bright white main beam. The XP's Trax feature is 150% brighter than the original Carnivore light. It is advertised as a light designed for hunters, by hunters. "Research shows that the human eye is most sensitive to the color red and much less discerning of dark colors such as blue and black. We've calibrated multiple light spectrums in a way that makes the red of blood appear to virtually jump off the ground. Once you've found the trail, you can easily toggle back and forth between the bright white xenon light and the TRAX LED mode to locate your trophy and find your way home." The XP's main (white) light provides 40 lumen and 530 lux output from its three watt, white Cree LED. This lets you see up to 300 feet at night. The Carnivore is powered by four AA alkaline cells, which provide over eight hours of run time. The Carnivore XP comes with a Realtree AP camo finish. It is sold as a complete, blister-packed kit that includes a carrying holster, clip, wrist lanyard and four AA alkaline batteries and is covered by a Gerber Limited Lifetime Warranty against defects in materials and workmanship for as long as the consumer owns the product. Here are some measurements and specifications for the Gerber Carnivore XP. As you can see from the photo at the top of this page, the Carnivore XP is not a typical, tubular flashlight. Instead, it has an upright handle that feels a little like a single stack pistol's grip and two light heads facing forward. The front and back of the grip are covered by rubber panels for a secure and comfortable grip. The upper light bezel is for the main (white) light and directly below that is the Trax LED array in a separate bezel. Immediately below the Trax bezel is the mode switch, mounted at the front of the light. The main power switch is on top of the grip, right behind the main light head. You click the main power switch on and then toggle from white beam to Trax beam to red night vision beam using the mode switch. Turn the light on and then tap the on/off switch to flash the main beam. (Do you know Morse code?) Momentarily pressing the on/off switch also defaults the Carnivore XP to main beam mode from either the red light or Trax modes; no need to use the mode button to cycle through all three modes if you are in a hurry to see what is making that growling sound up ahead. The battery pack slides into the bottom of the grip like a magazine into a pistol. It has a triple rubber seal, so you have to press the little tabs on each side of the battery pack inward and pull hard to remove the battery pack. As already mentioned, the battery pack holds four common, inexpensive, AA cells. The main bezel can be unscrewed, although there is no reason to do so, and it is "O" ring sealed against dust and moisture. Neither of us were bleeding at the time of this review, it wasn't deer season and none of our neighbors were willing to volunteer to bleed for us, so we will have to take Gerber's word that the Trax feature works as advertised. We can verify that the red light mode intended to preserve night vision and main (white light) modes work well. In fact, the red light/night vision mode would be handy for the amateur astronomer as well as the outdoorsman. The main beam provides a bright center spot with a wide, defined, surrounding floodlit area. The XP is ergonomically designed, comfortable in the hand and works well. 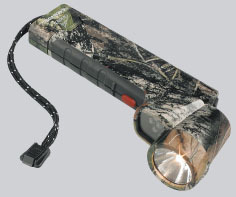 Although designed with the hunter in mind, it is also a good, general-purpose flashlight for use outdoors at night. Copyright 2008, 2016 by chuckhawks.com. All rights reserved.